Large Lego Minifigure Display Case. 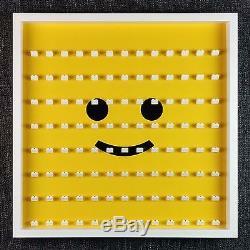 White Minifig Storage Case Frame - Yellow Face Design. Frame Size: 52cm x 52cm. Brand new, made fo order. Dust free, perspex front frame. For your peace of mind. 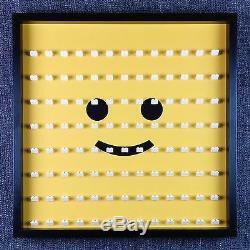 White Lego Head Minifigue Display Case. Keep your Lego minifigure collection safe and dust free with this huge 52cm x 52cm display case. This frame includes 104 quality compatible Lego angled bricks attached to a premium solvent printed background in a 4.5cm deep display case frame. The blocks are evenly placed giving the optimal area around each minifigue. The rigid backboards we use are 500mm x 500mm and leave 40mm of depth for your figures to be placed. The vast majority of minifigures will fit but some may not so please check. If you have any quierys please get in touch and I'll be happy to help. This frame will be dispatched same day and you should recieve it within a couple of days. Custom frame orders will take a little longer. We pack these larger size frames with protective corners, several layers of bubblewrap and heat shrink which gives supierior protection over cardboard and bubblewrap alone. This means you should receive it in pristeen condition regardless of how heavy handed the couriers are! Dispatched same day, via myHermes, if your order is with us before 2pm. Take a look at our online store for more unique and exclusive accessories. Must be in new resalable condition, undamaged with the original packaging. Connect with us for updates on new products and unmissable special offers. Ordered 2day received the next. The item "Minifig Face LEGO Large Display Frame White Storage Case Fit 104 Minifigures BIG" is in sale since Wednesday, November 9, 2016. This item is in the category "Toys & Games\Construction & Building Toys\LEGO Building Toys\LEGO Complete Sets & Packs". The seller is "bedezired" and is located in Halifax, West Yorkshire. This item can be shipped to United Kingdom, Antigua and barbuda, Austria, Belgium, Bulgaria, Croatia, Cyprus, Czech republic, Denmark, Estonia, Finland, France, Germany, Greece, Hungary, Ireland, Italy, Latvia, Lithuania, Luxembourg, Malta, Netherlands, Poland, Portugal, Romania, Slovakia, Slovenia, Spain, Sweden, Australia, United States, Canada, Brazil, Japan, New Zealand, China, Israel, Hong Kong, Norway, Indonesia, Malaysia, Mexico, Singapore, South Korea, Switzerland, Taiwan, Thailand, Bangladesh, Belize, Bermuda, Bolivia, Barbados, Brunei darussalam, Cayman islands, Dominica, Ecuador, Egypt, Guernsey, Gibraltar, Guadeloupe, Grenada, French guiana, Iceland, Jersey, Jordan, Cambodia, Saint kitts and nevis, Saint lucia, Liechtenstein, Sri lanka, Macao, Monaco, Maldives, Montserrat, Martinique, Nicaragua, Oman, Pakistan, Peru, Paraguay, Reunion, Turks and caicos islands, Aruba, Saudi arabia, South africa, United arab emirates, Ukraine, Chile.